Delaware Arts Info: The Seasons: Beautiful and Baroque! The Seasons: Beautiful and Baroque! Brandywine Baroque always features some of the world’s top musicians. At their recent Four Seasons concert, the audience was graced with some of the finest fiddling and singing one can hear. A fellow singer friend commented several times how amazing it was to be in a beautifully renovated barn in the countryside enjoying a fabulous sold out concert. Following the concert were guided walks in the fragrant woods surrounding The Barn at Flintwoods. The afternoon opened with George Frideric Handel’s cantata: Notte placida e cheta, sung by the lovely Laura Heimes. The piece explored the wide palette of love’s emotions through its poetry and sometimes flowery, ornamented phrases. Heimes’ pure easy tone and expressive phrasing brought this little of a piece to life. Her physical and emotional interaction with the instrumentalists was endearing and added an organic wholeness to the effect on stage. 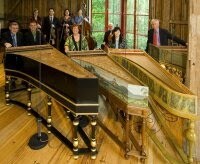 On the 17th Century Spanish harpsichord was the group’s artistic director, Karen Flint. The instrument was discovered in a Salamancan convent, where bored nuns decorated the once plain pine instrument with a faux marble design. Flint has extensive knowledge and expertise in the Baroque repertoire, as she possesses an expansive solo repertoire and accompanies most of the works, which require continuo. Eileen Grycky handled Antonio Vivaldi’s Concerto for flute, Op. 10, No. 6, well, with its dauntingly challenging passages. She was beautifully supported by the ensemble. Violinist Martin Davids is a master of the Baroque Style. In Vivaldi’s Concerto for Violin, each phrase was planned out carefully, each note executed precisely, and with perfect intonation. His love for the music poured out his instrument, and he led his ensemble gently and clearly. Vivaldi’s Four Seasons is one of the best-loved and well-known classical concertos of all times. This time, I heard it in a way that gave me new insight. Soloist Cynthia Freivogel stunned the audience with her exciting tempos, use of rubato and light-hearted humor. We giggled at her “drunken” playing in the ubriachi dormienti (L’autunno, Adagio) as she kept nodding off. The ensemble’s earthy tone quality is so appropriate for Vivaldi’s love song to nature, for which he wrote both the poetry and music. Be sure to get your tickets early for Brandywine Baroque’s upcoming Dumont Concerts May 28-30. The programs, a festival celebration of harpsichord music and performance, will feature works by Jacquet de La Giuerre, François Couperin, William Byrd, Frescobali and more. Davitt Moroney, Arthur Haas, Edward Parmentier and Karen Flint will perform.